Today the Honourable Donna Harpauer, Minister of Finance, delivered the 2019–20 Provincial Budget: The Right Balance. The Minister delivered a balanced budget with a projected surplus of $382 million. Overall projected expense for the year is $14.99 billion, an increase of 2.6% over last year’s budget. The budget items areas related to arts and creative industries showed a decrease of about 1.3%. The Community Initiatives Fund (which has the largest decrease) is forecasting lower profits based on gaming revenue. While no announcement has been made yet, the line Support for Provincial Heritage and Culture traditionally included money for the ArtsVest program. Money in the Community Sport, Culture and Recreation Programs line supports the 2019 Western Canadian Summer Games. 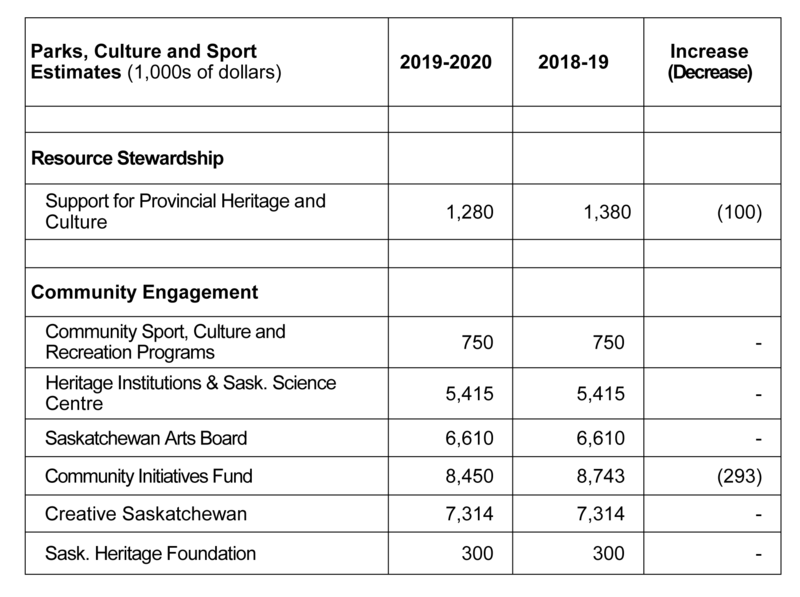 The funding levels of both the Saskatchewan Arts Board and Creative Saskatchewan remained the same, so any increases in the cost of living will need to be absorbed by the agencies. Following are excerpts from the Parks, Culture, and Sport section of the 19-20 Estimates. Links to other budget documents can be found here.